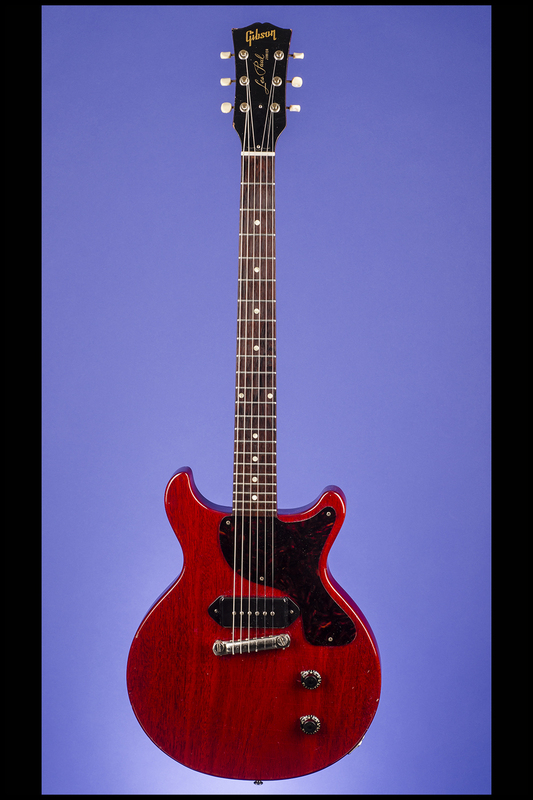 Les Paul Junior Guitars | Fretted Americana Inc.
1958 Gibson Les Paul Junior. This super light guitar weighs just 6.40 lbs. and has a nice, fat nut width of 1 11/16 inches and a standard Gibson scale length of 24 3/4 inches. 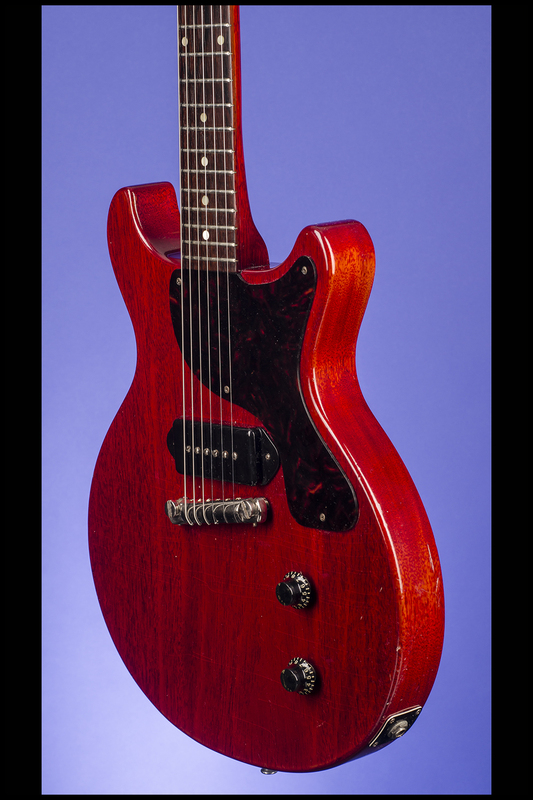 Solid mahogany body with rounded edges, one-piece mahogany neck with a typical '58 wonderful medium-to-thick style profile. Brazilian rosewood fretboard with 22 original jumbo frets and inlaid pearl dot position markers. Headstock with "Gibson" logo and "Les Paul / Junior" silk-screened in gold. Black plastic bell-shaped truss-rod cover with two screws. Closed-back single-line Kluson Deluxe strip tuners with white plastic oval buttons. 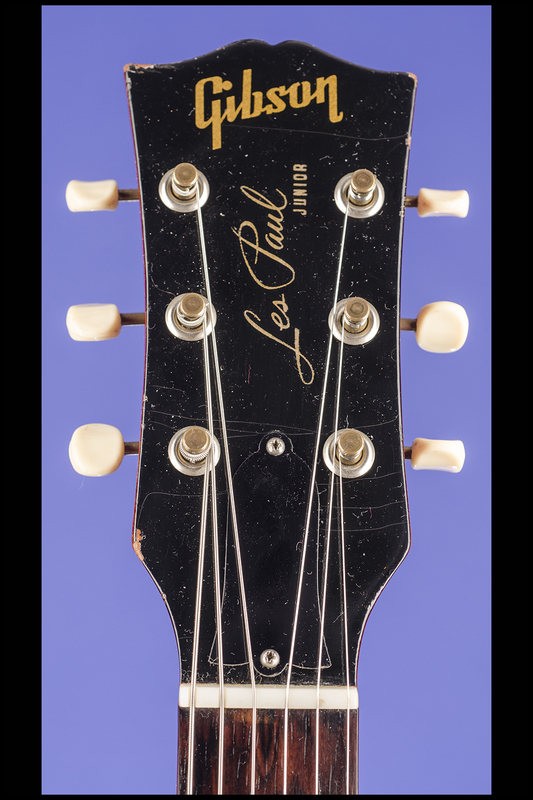 Serial number "7037" inked-on in black on the back of the headstock. One super black P-90 pickup with an output of 7.60k. Black plastic pickup cover stamped on the underside "UC - 450 - 1 / 1". Single-ply tortoiseshell plastic (0.08 inches thick) pickguard with four screws. Two controls (one volume, one tone) on the lower treble bout. Black plastic bell-shaped "Bell" knobs. The potentiometers are stamped "134 841" (Centralab October 1958) and the capacitor is the requisite 'Bumble-Bee' type. 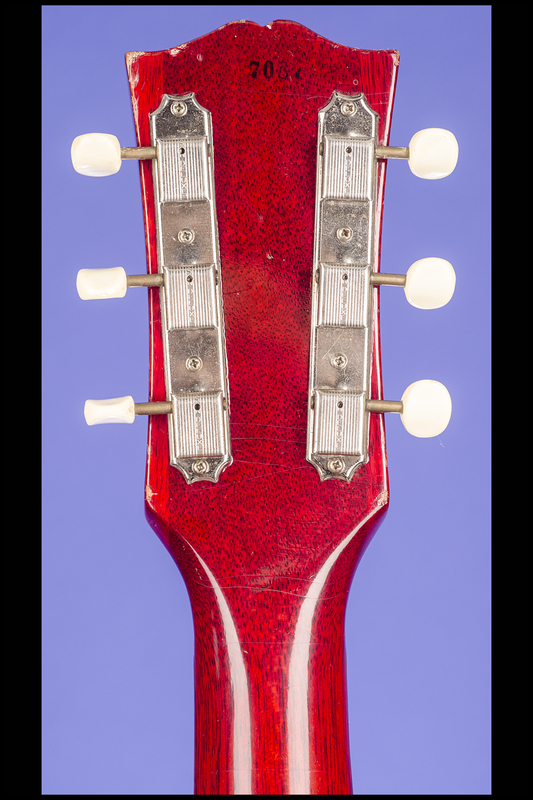 Combination "wrap-over" bar bridge/stud tailpiece. 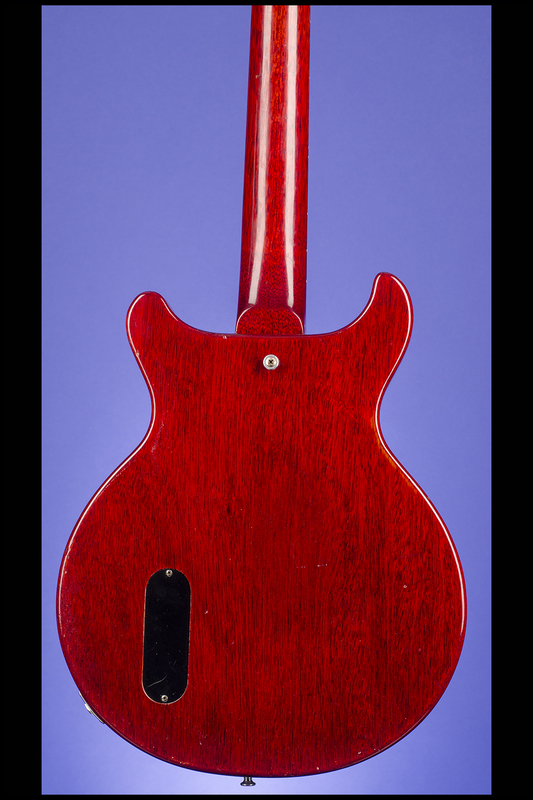 There is a miniscule amount of belt buckle wear on the back of the guitar - nothing through the finish. There are a few very small indentations on the sides of the body and some very fine finish checking. There is very little wear to the original jumbo frets and no wear to the Brazilian rosewood fretboard. The color is a deep rich cherry red with no fading whatsoever. 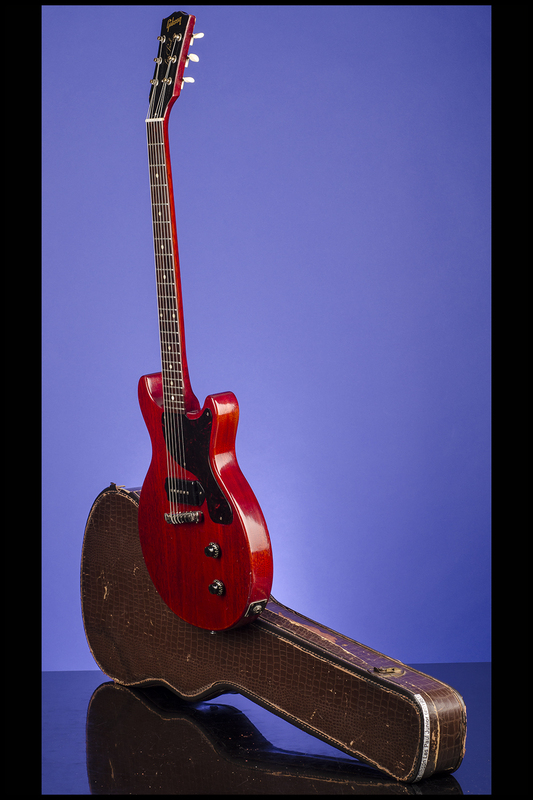 This incredible fifty-eight year old 'under-the-bed' guitar is in near mint (9.25) condition. 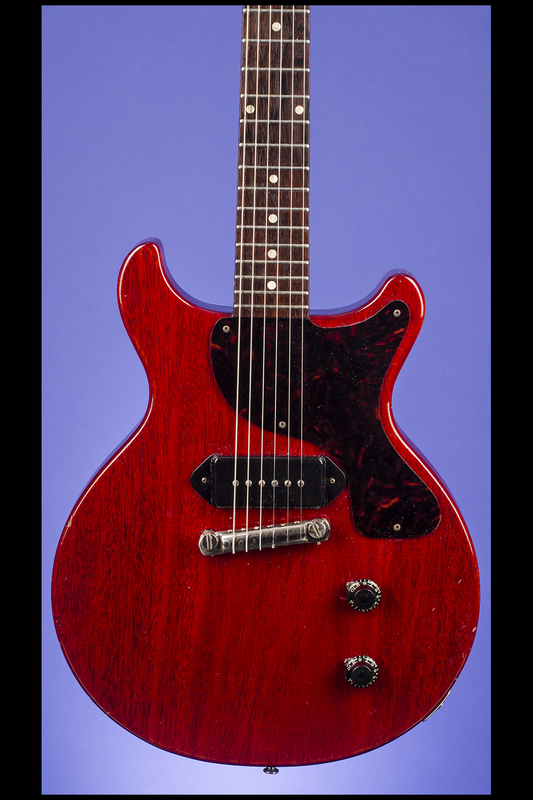 This is quite simply the finest example of an all original 'first generation' double-cut 1958 Les Paul Junior with the noticeably sharper body edge (just like the edges on the '54-'58 single-cut Juniors). We calculate the month of production to be either November or December 1958 - as from the Gibson records we know that in late '58 there were some 4-digit serial numbers like 6234 and 7234 with no "8" or "9" as the leading digit and also that it was in very late '58 that Gibson changed the fret size from .070" wide frets to .100" wide frets (jumbo's). The sound of this little beastie is also quite simply "the bestest"! Housed in the original 'worn' Gibson brown 'Alligator' softshell case with brown felt lining (8.50). 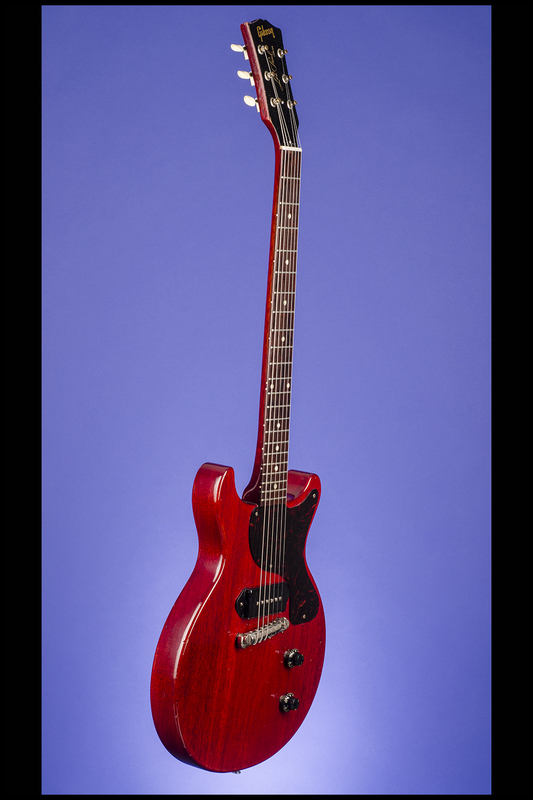 "In mid-1958 an extensive body redesign brought about a novel double cutaway shape permitting complete access to the entire fingerboard via a neck-to-body junction at the 22nd fret. Contrary to what appearances might suggest, this redesign did not alter the overall body dimensions. 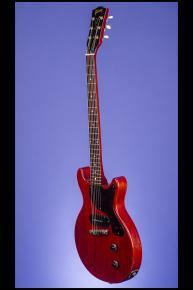 But in the process the standard finish was changed from sunburst to cherry red… " (A.R. 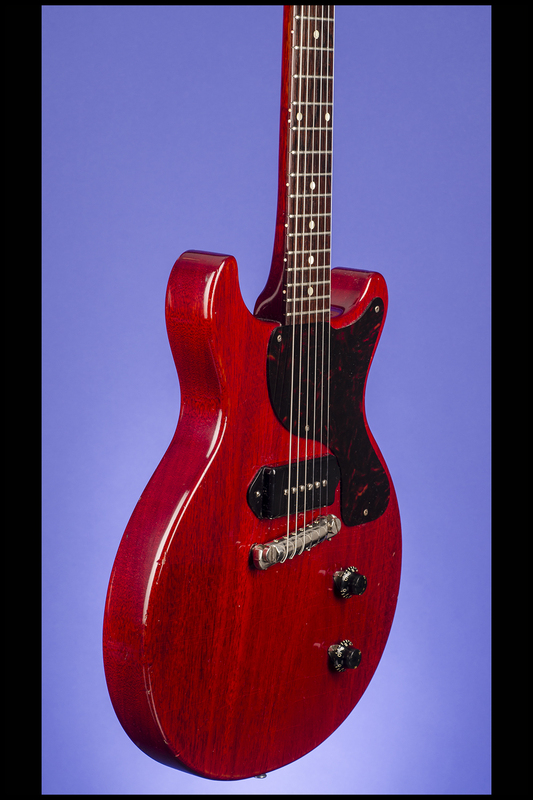 Duchossoir, Gibson Electrics. The Classic Years, p. 205-206). "Ted McCarty explained the re-design as a reaction to player's requests. "They wanted to be able to thumb the sixth string," he said, "but they couldn't do it if the only cutaway was over on the treble side. So we made them with another cutaway, so they could get up there. We did things that the players wanted, as much as anything." The Junior's fresh look was enhanced with a new cherry red finish. (Tony Bacon, 50 Years of the Gibson Les Paul, pp. 33 & 36). 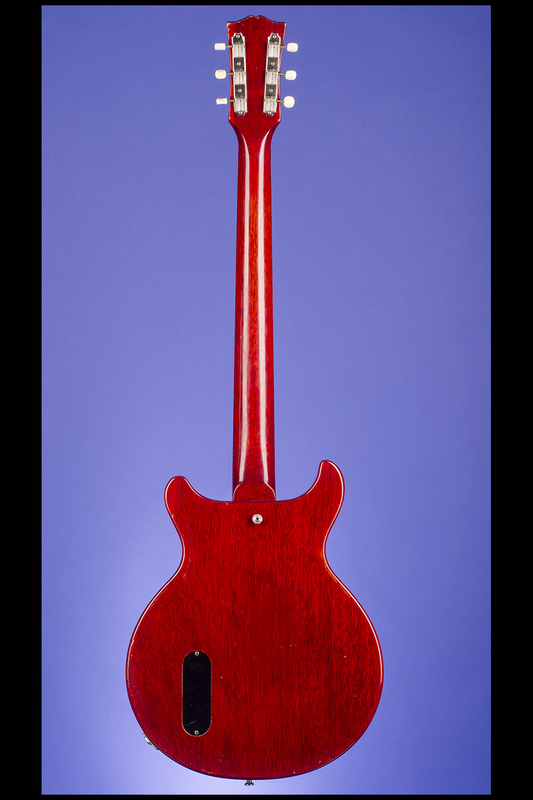 The 'double-cut' Gibson Les Paul Junior was the favorite choice of many great guitarists including (in alphabetical order) Billie Joe Armstrong (Green Day); Mick Box (Uriah Heep); Allen Collins (Lynyrd Skynyrd); Mick Jones (The Clash); Mick Ralphs (Bad Company); Keith Richards (The Rolling Stones) and Leslie West (Mountain).